When building walls to level 12, you will receive 650,001 EXP per wall. This is a grand total of 169,000,260 experience points for completing all the level 12 walls! 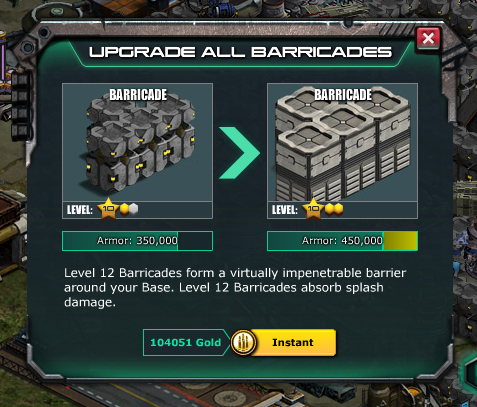 Total Armor rating for each Barricade at level 12 is 450,000 damage units! I know there will be more questions about the barricades, but these have been a few fun facts you can use to help you understand what the new walls mean to you as a player. It will cost you around 100,000 gold if you want to upgrade all your walls instantly! Which comes to roughly $10,000; which most in American almost consider that above the living wage! My Level 12 walls not helping in Invasion. The Over Maxed Kixeye units cut right through them. Than again, kixeye can cheat. It's there game. They know they would loss if it was fair. Here are my fun facts about the walls. It will cost 410 gold to upgrade walls to level 12. It will cost 104,051 gold to upgrade 260 walls to level 12 if you use the upgrade all option. You will need to sit and click 780 times, Each building you need to move is additional 6 clicks. Ok... how many lvl 75 elites will it take to get that much res??? What idiot would spend 100000 coins just to upgrade walls? The prices to coin anything in this game are insanely inflated as it is. It may be tedious to click and click, but why waste that much cash on something that is not tangible? 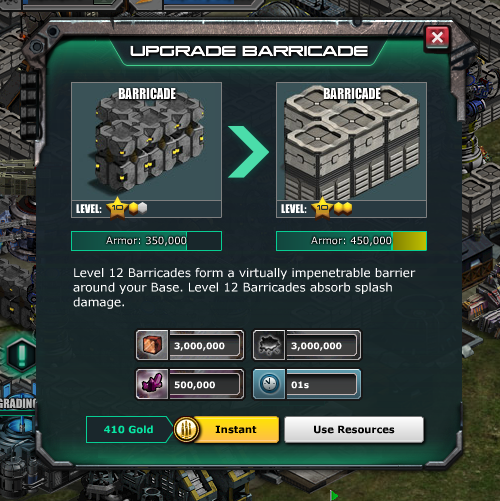 Kixeye has actually taken note to this complaint and reduced the gold costs for upgrading walls. I believe that the total cost is at this time is around 10k gold for upgrading 260 walls from level 12 to 13. The super walls has been delayed due to a rendering issue with rectangular buildings.